The design of this ball pit is one of the better looking designs. 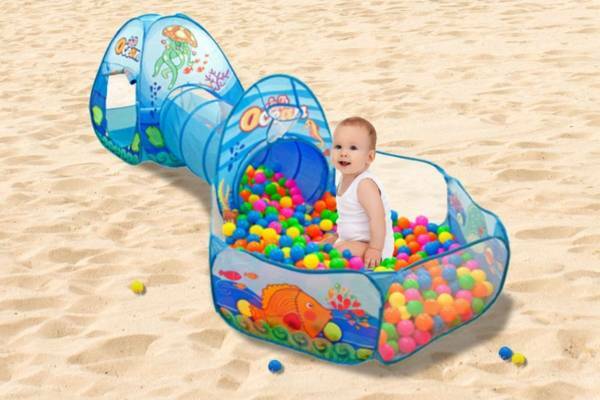 Featuring a fun under the sea theme and complete with a tunnel that connects the two ball pit sections, children can play for hours using their imagination. It's big enough for both babies and toddlers, providing enough room for play without being too big and oddly shaped. The colors are bright and inviting, welcoming children to play. The material used is a durable heavy duty polyester cloth making it built to last. One of the better things about this ball bit is that each piece connects to the other, allowing it to be used with all three pieces together or just a piece at a time. This is great for small spaces or quick play sessions. Not only is the ball bit detachable, but each section quickly pops up for play, eliminating a stressful and confusing setup each time. 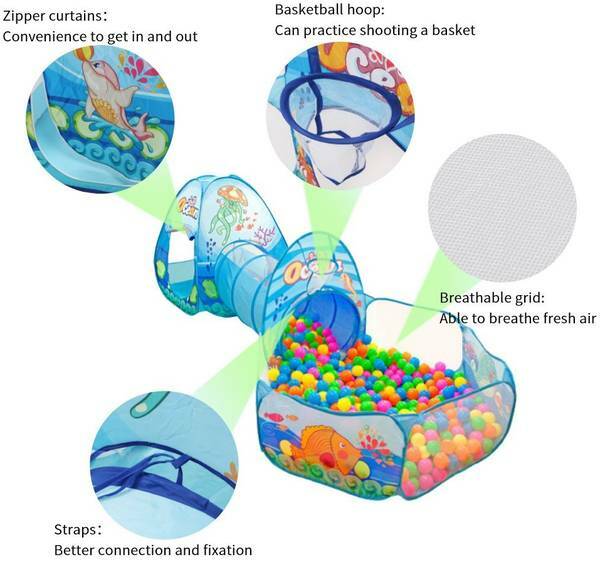 This feature allows the ball pit to quickly be popped up and pressed down for easy play and easy storage. 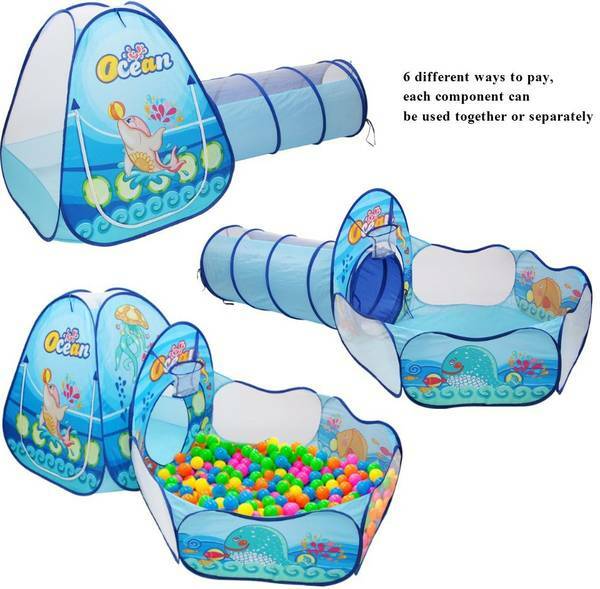 Another benefit that follows this ball pit set is that it can be used both indoors and outdoors thanks to its durable and sturdy construction. Simply pop it open for play inside or out, fill with balls (not included) and play (you can find out how much ball pit balls cost here). You won't have to worry about the tent becoming torn or ruined outside or inside. With regular use, the tent is made to last. However, heavy or rough use may cause damage, as well as placing heavy objects on the tent or tunnel. 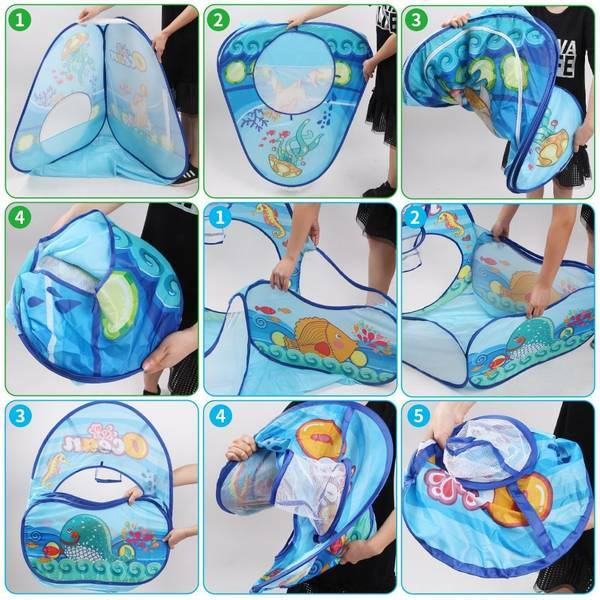 This ball pit tent set up is great for ages six months to about three years old. This is somewhat different than other ball pits on the market that are made for older children. The set up is the right size for babies and toddlers, making it a great gift for any young child. This set isn't ideal for older children though, so avoid buying for larger or older children who may play too rough or be too big for the design. If you have an older kid, visit our bouncing toys for 2 year olds guide or our ball pits for toddlers guide.